Author(s): Anna Truini*, Lung Cancer Unit, IRCCS AOU San Martino-IST, L. go R. Benzi 10, 16132 Genova, Italy. Simona Coco, Carlo Genova, Marco Mora, Maria G. Dal Bello, Irene Vanni, Angela Alama, Erika Rijavec, Giulia Barletta, Federica Biello, Claudia Maggioni, Francesco Grossi. Malignant Pleural Mesothelioma (MPM) is an aggressive disease characterized by a dismal prognosis, mainly due to late diagnosis. To date, there are very few treatment options available and the refractoriness to the majority of therapeutic strategies, leading to consider MPM a relevant problem in public health. Therefore, the identification of novel prognostic markers and alternative therapeutic strategies remain a top priority. 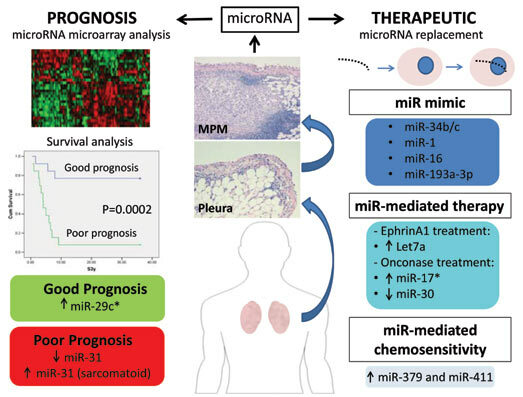 Several efforts have been made in this direction and to date a number of studies have investigated the role of microRNA as biomarkers in MPM, identifying the potential prognostic role of miR-29c* and miR-31. Very recently, the first microRNA signature able to discriminate poor or and good prognosis of MPM patients underwent surgery has been published. Very interestingly, several microRNA such as miR-1, miR-16, and miR-34b/c have been identified as potential therapeutic agents. Indeed, the forced expression of these microRNA resulted in anti-tumor effects both in vitro and in vivo. Besides, the introduction of microRNA mimic, some agents such as EphrinA1 and Onconase, seemed to exert anti-tumor effects through specific microRNA. Moreover, microRNA have also been reported to play a role in chemoresistance enhancing the sensitivity to specific drug such as pemetrexed. In this review the most relevant and updated data about the role of microRNA as prognostic markers and therapeutic agents in MPM will be presented, opening new avenues towards improved management of this aggressive disease. Keywords: Malignant pleural mesothelioma, microRNA, prognosis, prognostic signature, therapeutic, tumor suppressor microRNA. Affiliation:Lung Cancer Unit, IRCCS AOU San Martino-IST, L. go R. Benzi 10, 16132 Genova, Italy. Keywords:Malignant pleural mesothelioma, microRNA, prognosis, prognostic signature, therapeutic, tumor suppressor microRNA. Abstract:Malignant Pleural Mesothelioma (MPM) is an aggressive disease characterized by a dismal prognosis, mainly due to late diagnosis. To date, there are very few treatment options available and the refractoriness to the majority of therapeutic strategies, leading to consider MPM a relevant problem in public health. Therefore, the identification of novel prognostic markers and alternative therapeutic strategies remain a top priority. Several efforts have been made in this direction and to date a number of studies have investigated the role of microRNA as biomarkers in MPM, identifying the potential prognostic role of miR-29c* and miR-31. Very recently, the first microRNA signature able to discriminate poor or and good prognosis of MPM patients underwent surgery has been published. Very interestingly, several microRNA such as miR-1, miR-16, and miR-34b/c have been identified as potential therapeutic agents. Indeed, the forced expression of these microRNA resulted in anti-tumor effects both in vitro and in vivo. Besides, the introduction of microRNA mimic, some agents such as EphrinA1 and Onconase, seemed to exert anti-tumor effects through specific microRNA. Moreover, microRNA have also been reported to play a role in chemoresistance enhancing the sensitivity to specific drug such as pemetrexed. In this review the most relevant and updated data about the role of microRNA as prognostic markers and therapeutic agents in MPM will be presented, opening new avenues towards improved management of this aggressive disease.